Now Book your train tickets using Mobile Phone, anywhere and anytime WITHOUT using Internet connection. 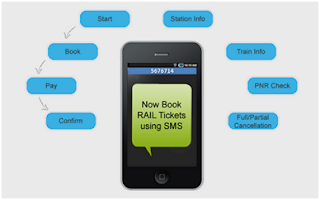 Train passengers will be able to use their mobile phones to book tickets through a simple text-messaging-based-SMS facility or a menu-based dialing service –USSD service. Currently, only registered IRCTC users can use these services. The scheme is user-friendly, secure and also Eco-friendly, as no print out is required. No need of internet at any stage viz, booking, payment, cancellation etc. One has to register the mobile number with IRCTC as well as one's bank. The Bank provides MMID (Mobile Money Identifier) and OTP (one time password) for authorization of payment. The passenger has to type the train number, destination, journey date, class and passenger details like name, age and gender on the SMS box. The sender will receive transaction ID and then make payment through sending another SMS by typing PAY followed by the transaction ID, MMID as received from the bank and password. On successful booking of ticket, message will be sent to the user by IRCTC which will suffice as valid authority to travel along with photo ID card in original. The scheme will be on pilot basis and will not be available during the 8am -12pm for booking ARP/Tatkal/General tickets. Irctc is one of the best website to online train tickets booking. Thanks to share with us.